There's no cash inside, but these red envelopes are still money. 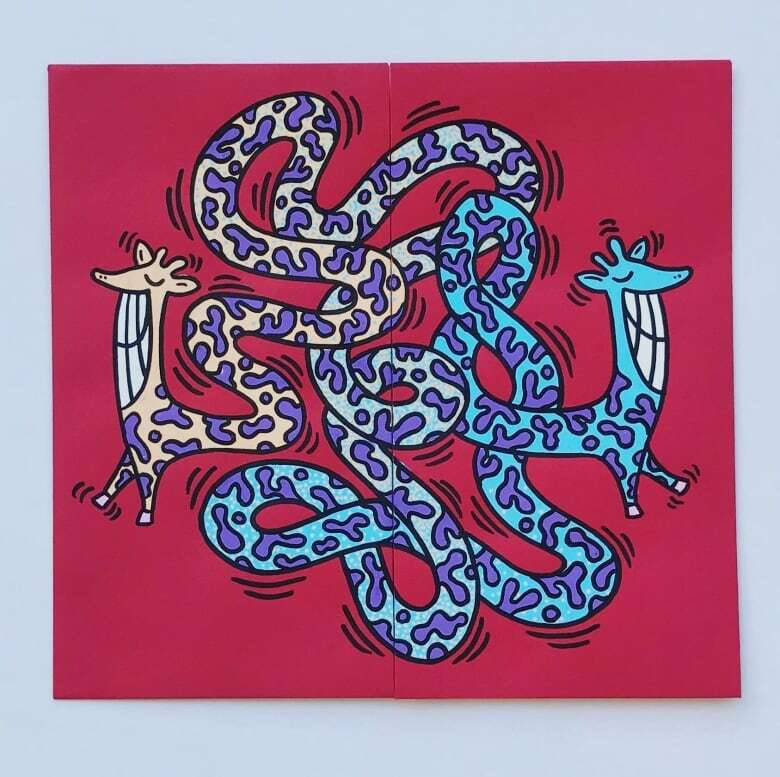 Get a sneak peek at the Get Lucky art show. As a kid growing up in Vancouver, Pearl Lam says that Lunar New Year wasn't complete without a few standard traditions — a family trip to Chinatown for the big parade, for instance, and plenty of "lucky food items" at home. But her favourite thing about the holiday? The red envelopes — hóngbāo, or lai see. "Yeah! That was always the most exciting thing as a kid," Lam says. "You're given lucky money in red envelopes symbolizing sharing prosperity and having a prosperous new year." Lately, Lam's been the one giving out red envelopes, minus the cash. 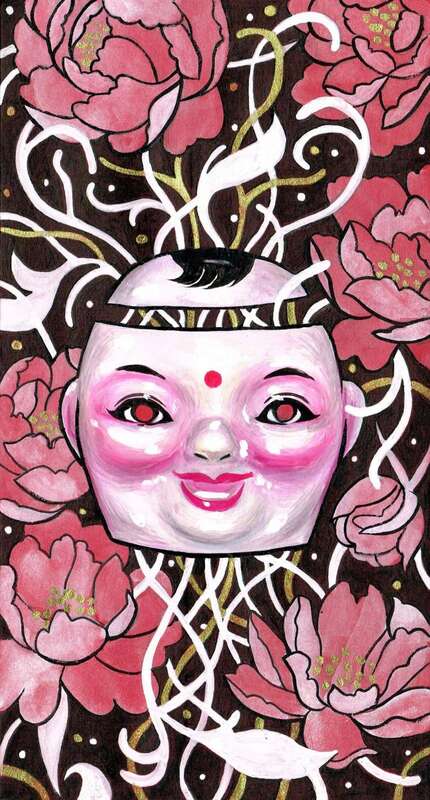 She's an organizer of the Get Lucky art show, which returns to Vancouver's Chinatown Sunday, Feb. 18 — and for the exhibition, she and co-founder Sylvia Tuason (the duo also run Vancouver city blog District Local) have recruited 36 artists. 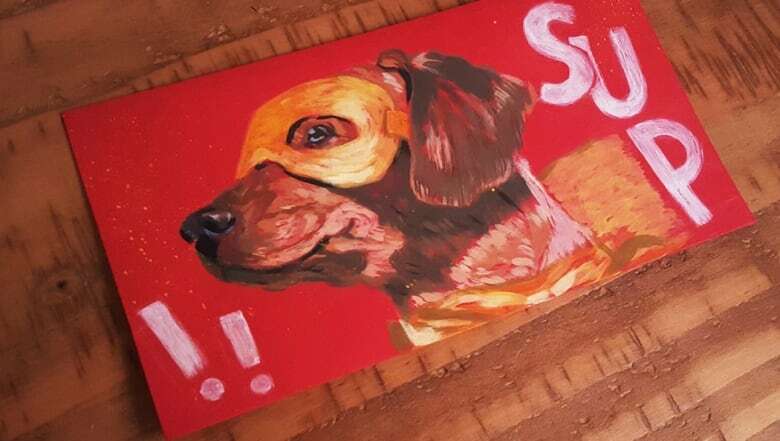 Everyone's told to follow one rule: scrap the canvas, and use a 9 x 17 cm red envelope instead. Lam got the idea from a similar event that's run out of the Grumpy Bert gallery in Brooklyn, and participants are welcome to submit as many envelopes as they like. The finished work will be on sale at the one-day show, with envelopes priced at $20-35 on average. 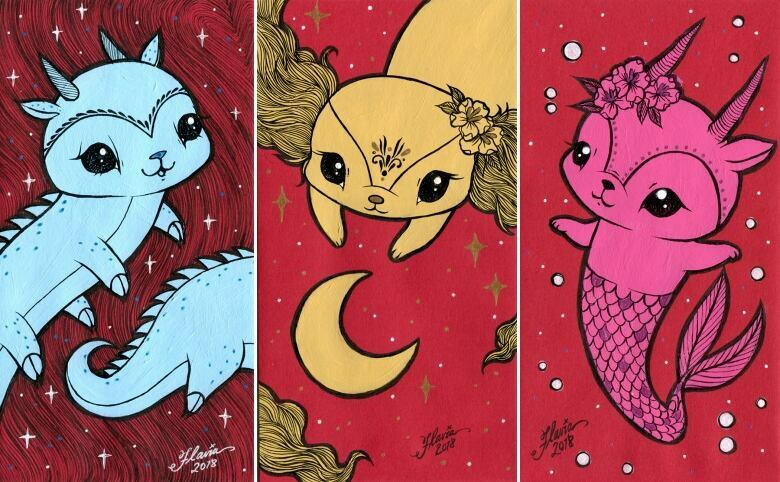 "Red envelopes, they usually have traditional Chinese art on them," Lam says — "though, I mean they're getting more and more modernized. I just saw one that has Paw Patrol characters laughs on the front," she laughs. "It's just a really fun canvas. It's small, it's vibrant and I think all the artists had a really fun time using that as a medium." The event venue, Fortune Sound Club, is right in Chinatown — on the route for the the 45th Annual Vancouver Chinese New Year Parade, in fact, which will be happening outside. The neighbourhood's rapidly changing, and Lam says the participating artists — illustrators and tattoo artists and graffiti muralists — were selected to reflect what the place looks like now. With rents on the rise, it's a spot that many are fighting to preserve. A campaign to name it a UNESCO World Heritage Site even launched last month — and Lam says Get Lucky is meant to reflect where Chinatown is at in this moment, as it goes into a new year. "The intent was to bring together all this melting pot of different cultures, different people, different walks of life — basically what Chinatown is now," she says. 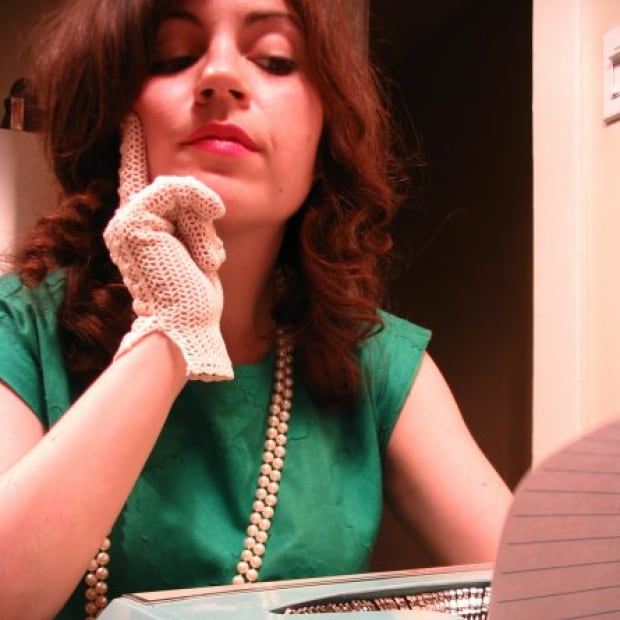 "There's a bit of the old and a bit of the new, and that's what this art show is signifying." Check out some of the art appearing at Get Lucky 2018! Jenny Hsieh: "Every year, my family has a huge feast with my relatives. Lunar New Year is a time for families to be together, eat good food and enjoy each other's company! Inspired by this year's Chinese zodiac animal, I chose to paint three dogs enjoying foods you would normally eat for the Lunar New Year. 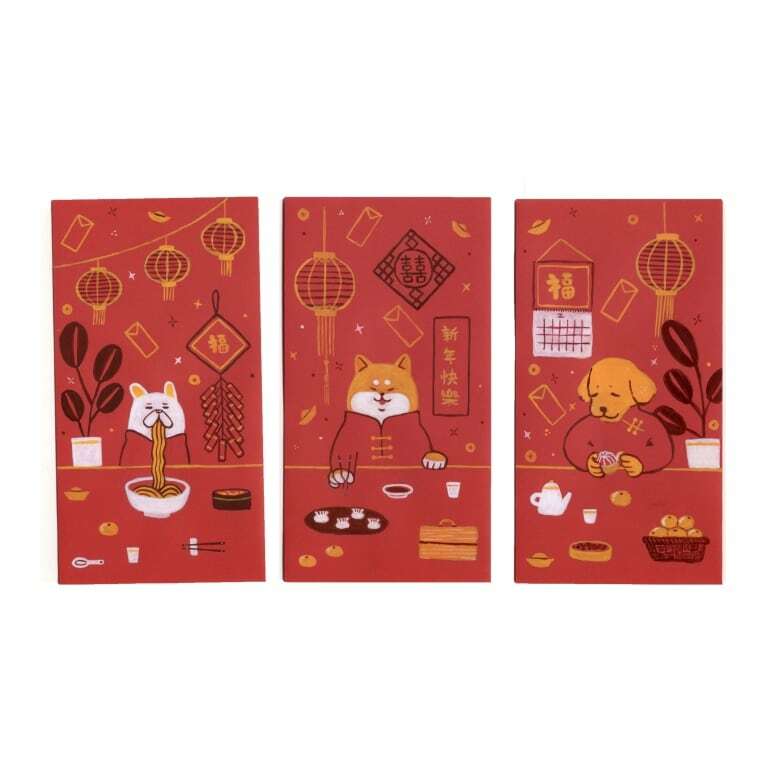 The foods that the dogs are enjoying (noodles, dumplings, and tangerines) are said to bring good luck." Priscilla Yu: "I love Lunar New Year! I go over to the homes of my relatives and parents to exchange good wishes, receive red pocket envelopes and enjoy a meal together. 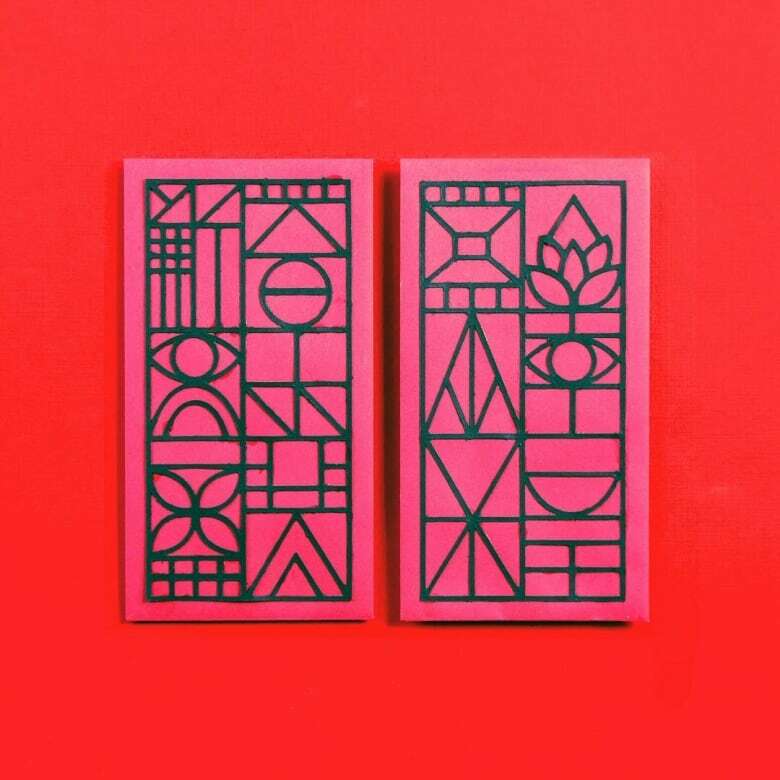 I just loved the idea of creating art on red envelopes. 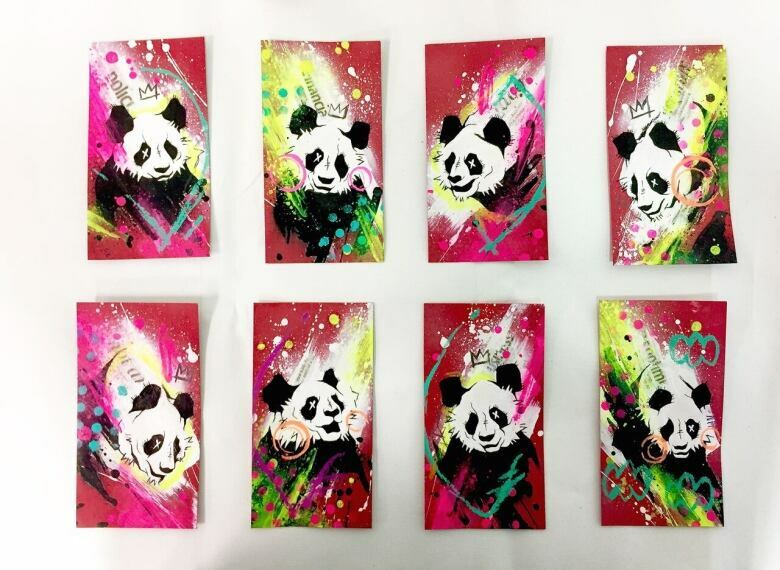 Red envelopes were something I grew up with and I had never used red envelopes as canvases before! According to the Chinese Zodiac, 2018 is the Year of the Dog. I wanted to create celebratory images with dogs as the main figures, tackling one of my New Year's resolutions, which is to have more fun." Syd Danger: "I'm always very inspired by tarot and medieval imagery and themes. Moons and the lunar cycle have a lot of influence in those genres. I also love creating pieces that speak to the cycle of life and death, and the changing world." Sandeep Johal: "I grew up in a Sikh household, so we didn't celebrate Lunar New Year, but I've been in Vancouver long enough to enjoy the celebrations that happen here every year. 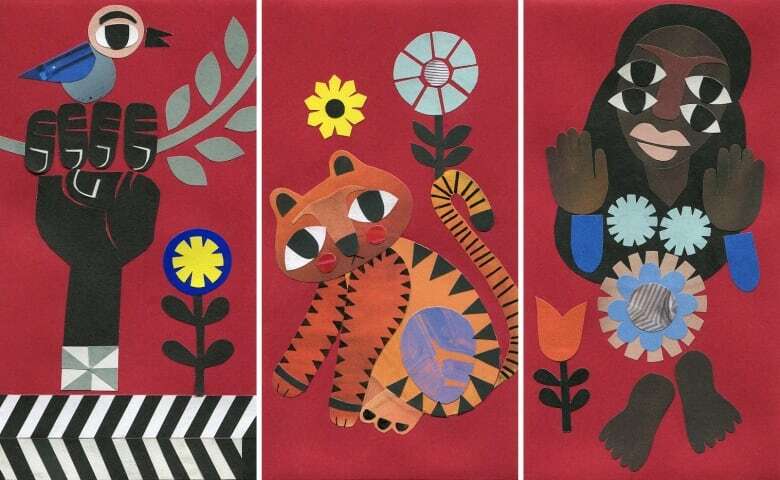 I took inspiration from some recent black-and-white folk art drawings of mine and re-imagined bits and pieces of them through collage. The imagery includes mysterious women with palms facing outwards, animals typically found in India and geometric patterning." Tierney Milne: "These pieces are inspired by small symbols of luck and how they can weave together to build your fortune, as well as the feeling of shifting into the fresh beginnings of spring," she writes. "What interested me about the Get Lucky show is that it brings together the artist community to celebrate, support and intersect with Chinatown in a unique way. I will be donating any money raised from the sale of my pieces back to supporting initiatives in Chinatown, and I'm really excited that there are so many artists I respect on the lineup." 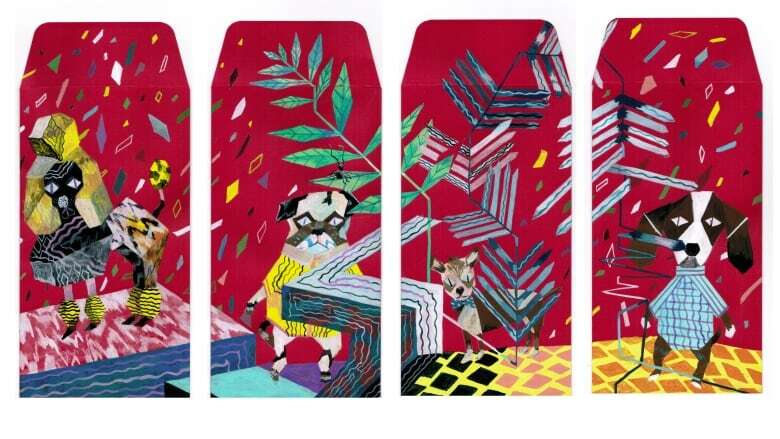 Matt Redway: "My work is usually based on depicting fun and happiness. Whether it's a two-headed giraffe or a person chugging a beer, the characters I draw always look like they're in a moment of almost zen-like bliss. It sometimes gets a little dark too, but I've kept it pretty lighthearted for this one." M W Bowen: "I don't celebrate Lunar New Year. I don't celebrate any holidays, really. I often forget what day of the week it is because I'm so busy with my work! I am a street artist as well as a gallery artist and a lot of my work draws from pop culture, which I use to make wry comments on society." 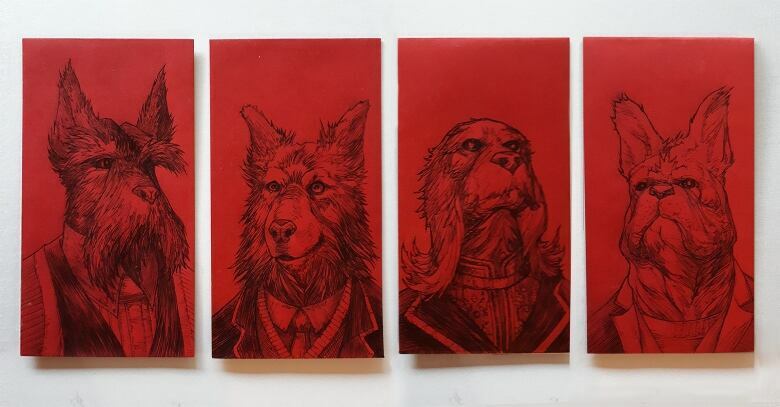 Aaron Wolf: "The Year of the Dog inspired the subject matter for my envelopes. I spent some time looking up Renaissance portrait paintings, Chinese traditional paintings and photos of dogs for inspiration." 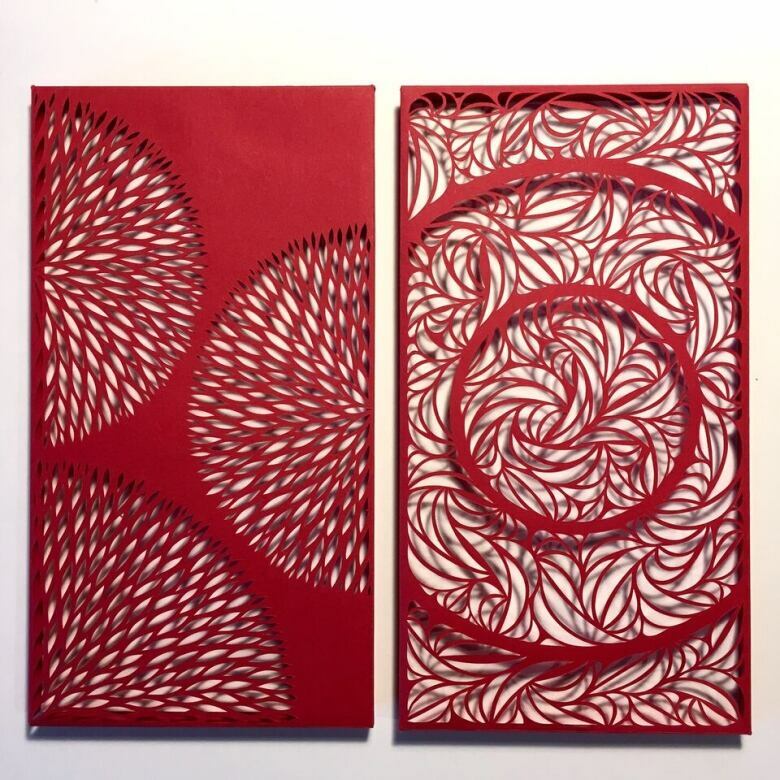 Rachael Ashe: "The work I created is typical to the type of intricate patterns I create with my cut paper work. I disassembled the envelopes so I could work on them flat and then made them into small shadowbox pieces to cast internal shadows." Fun fact: the title of this project translates to "Lunar New Year" in Japanese. 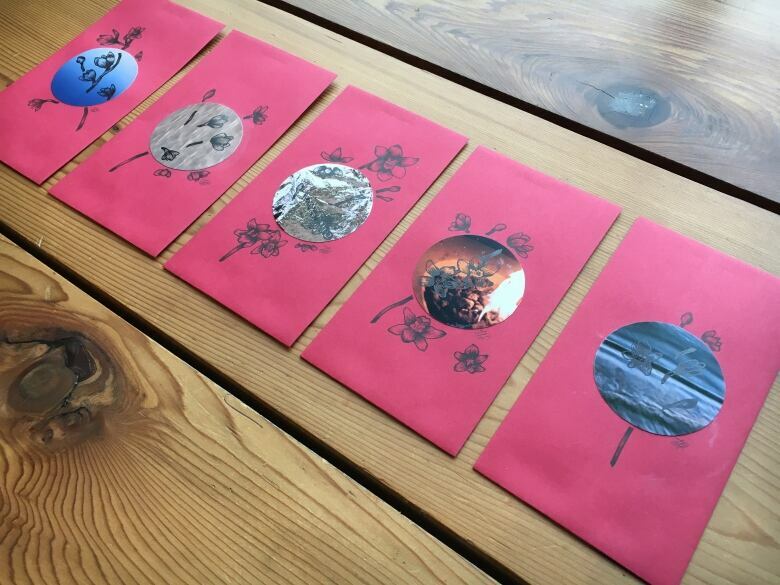 Writes Taka Sudo, whose studio is located in Vancouver's Chinatown: "So stoked to see these painted envelopes given and received during Lunar New Year." 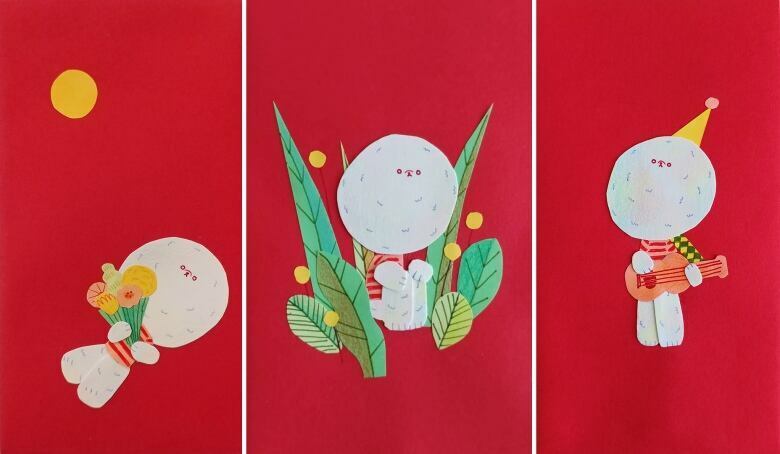 Flavia Chan: "Growing up, all the red envelopes I got were already pre-decorated with traditional visuals and text, so it's super cool to see red envelopes being used as a blank slate." Flory Huang: "I celebrate Lunar New Year with my family, though it varies throughout the years depending on logistics! When we're physically in same city, we typically gather for a meal to celebrate the New Year along with the tradition of giving red envelopes. My red envelopes honour the Year of the Dog without the literal representation of a canine and highlight the associated, lucky cymbidium/boat orchid for well wishes. I combined my hand drawings in ink with my visual (photographic) diary to represent the different elements associated with each zodiac." 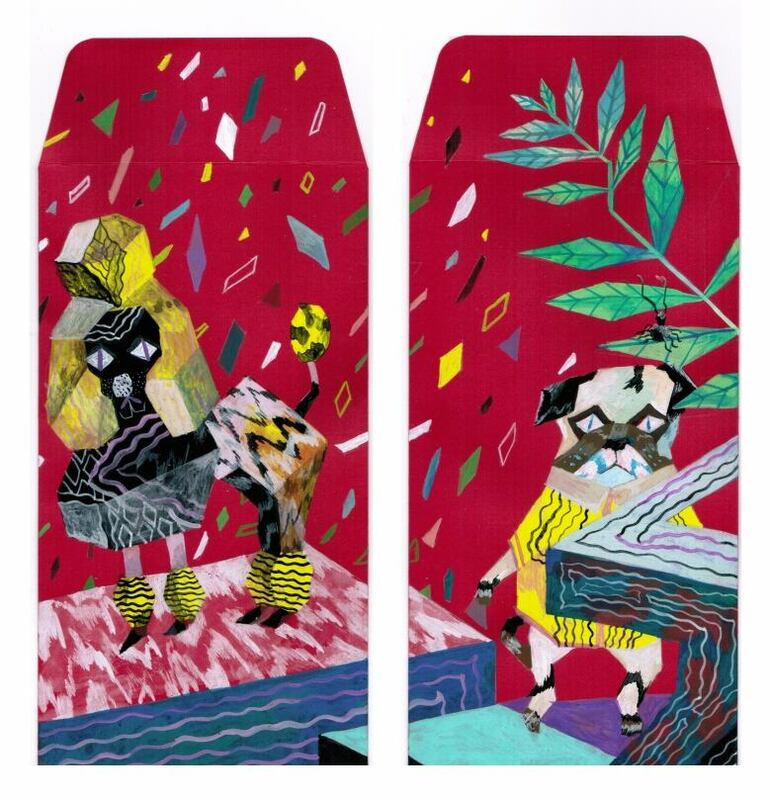 Sitji Chou: "My red envelopes were inspired by the Year of the Dog, and I wanted to draw bichon frises. 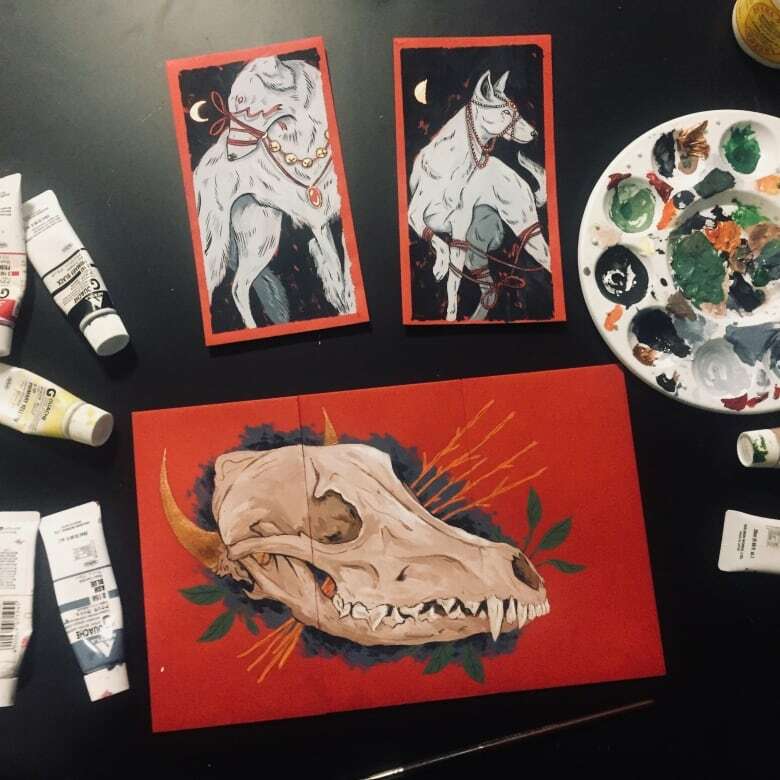 Originally, I was going to paint them — but the paper wasn't soaking in the gouache in a way I liked, so I ended up making them using cut paper!" Graeme Zirk's piece reflects on the Chinatown gentrification debate and what's brought generations of people to the rapidly changing area: "be it the first wave of European immigrants, Chinese immigrants and my yuppie generation." 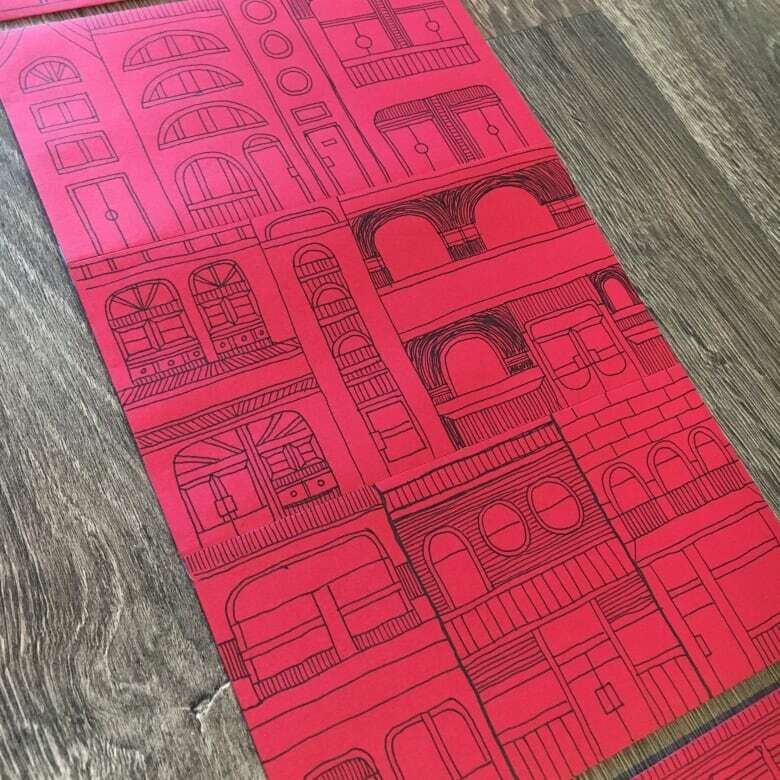 Says the artist: "To own property in Vancouver is my definition of luck, and in Chinese culture, red envelopes usually contain money. Luck and money seem to go hand in hand when it comes to home ownership." Katie So: "I don't [celebrate Lunar New Year], but I would as a kid (my Dad's side of the family is Chinese). We would have breakfast in Chinatown and watch the parade." Her envelope is inspired by childhood memories of watching the parade's lion dancers. Sara Khan: "I am from Pakistan and we actually don't celebrate the Lunar Year there, but having moved to Vancouver four years ago, I love that I am slowly getting exposed to it. Celebrations of any kind make me think of my family. Whether it's a wedding, a religious ceremony or any other kind of a party, the whole point of the event is for everyone to get together. 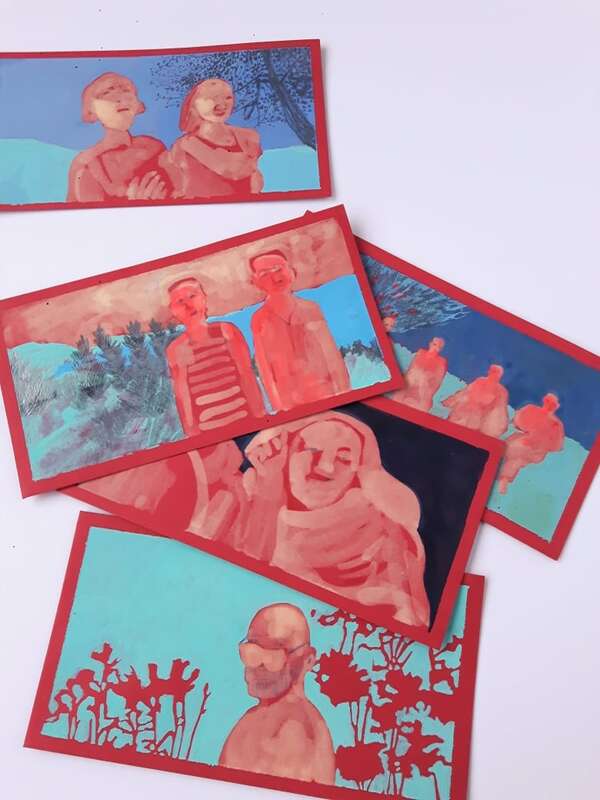 I used bleach on some parts of the envelopes to remove the red colour, and incorporated scenes or moments of merriment from my past onto them using paint."